That moment when streaming YouTube videos, after a video had finished playing, YouTube automatically Auto-play the next video. It's such an annoying moment if you ask me. This happens when using YouTube App to stream videos. Either the Android app, iOS or iPhone App. Without no doubts, YouTube is one of the most visited site in the world. YouTube is where people all over the world share videos ranging from documentaries, Movies, Sports, funny videos, Tutorials or events etc online. 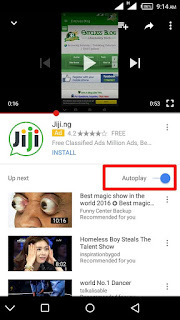 I will quickly teach you how to disable YouTube Autoplay Next video on Android, iOS or iPhone Youtube app. It's very simple. Kindly follow me along. If you are used to watching videos on YouTube, you will notice that after a particular video completes or finishes, another one which is probably the Next Video on YouTube will suddenly start to play without you authorizing it. This can be so annoying when you have another video you want to watch and also on a poor internet connection, to go back might be a problem. If you one of those that find this feature very annoying and wants to disable or turn off YouTube Autoplay Next Video on your Android app, iOS or iPhone YouTube app, below is how to do it. ==> Launch your YouTube app. ==> Open the video you want to watch and scroll down a bit. ==> You will see Auto-play toggle just below the video. ==> Toggle off the feature and this feature will be disabled on your YouTube app. NOTE: This method will remain permanent but if change account on your device, it will automatically revert back and you will have to follow the above method to toggle it off again. That's all friends. I'm sure you are now free from the annoying YouTube Autoplay feature. I hope you like this? How to turn off YouTube Autoplay next video. 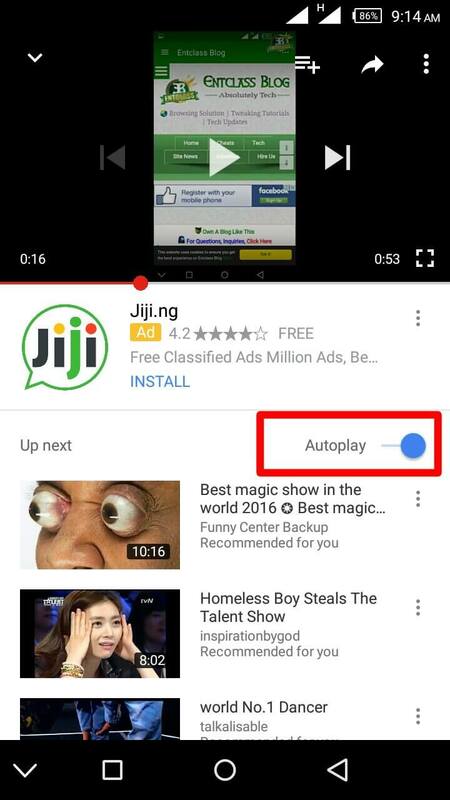 Disable YouTube Autoplay Next video on Android, iOS, iPhone. Turn off YouTube Autoplay next video. With all due respects sir, I'm not deleting your comments, and i don't delete comments. That's why i said it's currently not working.